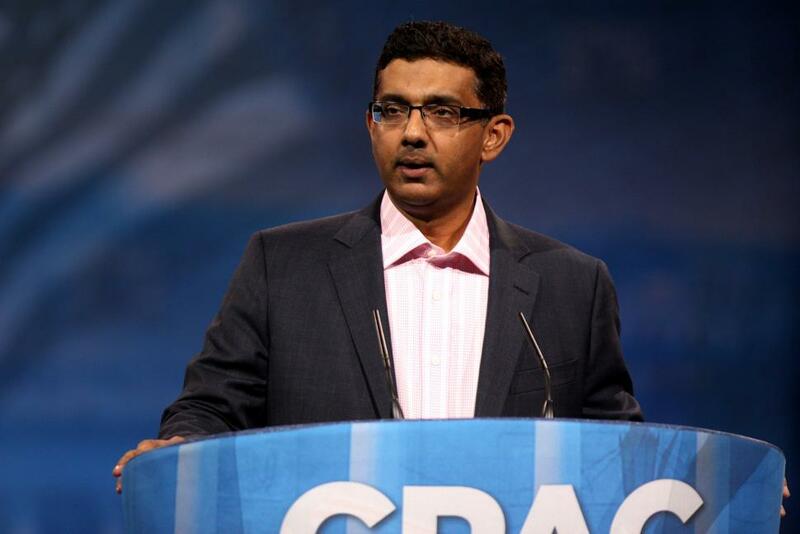 Dinesh D’Souza, who has seemingly abandoned his pretense of being a scholar to become an overt right-wing propagandist, has been pushing his latest movie, “Hillary’s America: The Secret History of the Democratic Party,” for months. He bragged back in March that it is so “emotionally powerful” that it will cause Democrats to need counseling. At last week’s Road to Majority conference, Religious Right activists were subjected to the trailer for “Hillary’s America” three times on Friday. D’Souza described the movie as “a retelling of the whole story of progressivism and the Democratic Party.” In it, he purports to expose the “soul of the Democratic Party.” The trailer features dramatic re-enactments of southern Democrats’ support for slavery, the KKK and Jim Crow. Sound familiar? 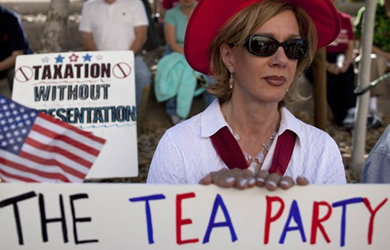 This is territory trod a full decade ago by D’Souza’s fellow conservative propagandist David Barton. At the time, PFAW called Barton’s DVD “Setting the Record Straight: American History in Black and White,” “staggeringly misleading” and “one-sided history.” The RNC had been bankrolling Barton’s outreach to African American and Hispanic churches. In Barton’s version of the Democrats-as-the-source-of-all-evil tale, history conveniently ended with passage of the 1964 Civil Rights Act. That allowed him to ignore the past half century, Goldwater’s opposition to civil rights legislation, the GOP’s infamous “southern strategy,” the GOP’s embrace of the segregationist “Dixiecrats,” and the modern Right Wing’s record of inflaming white racial resentment and using racial dog-whistles for political gain — as if it were a complete mystery why African Americans would ever vote for a Democratic candidate. 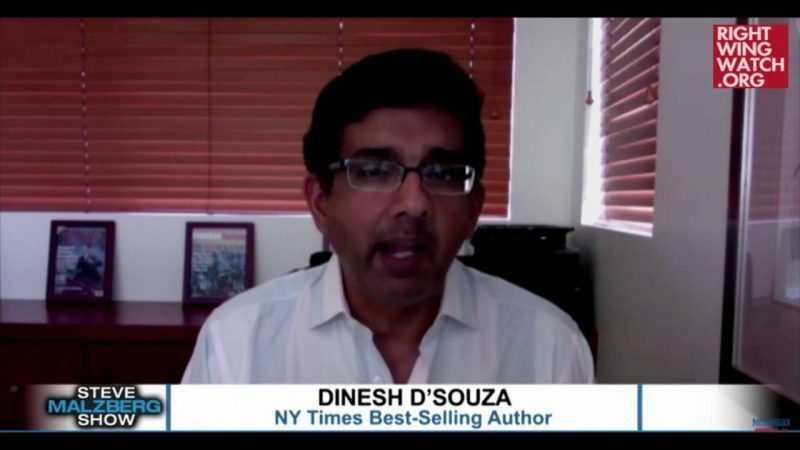 Of course this isn’t the first time D’Souza has tried to sway the outcome of an election. His 2012 movie, “2016: Obama’s America,” made a lot of money, but failed to prevent Obama’s re-election. D’Souza has been fuming for years that if only more voters had seen the movie, the outcome would have been different, a claim he made again on Friday night. It was part of his pitch for people to take their friends and fellow churchgoers to see his new movie on its opening weekend; he said a good opening would take it from 1500 to 2000 theaters. “Hillary’s America” is the second of D’Souza’s films aimed at keeping Clinton out of the White House. That was also the goal of 2014’s “America: Imagine the World Without Her,” which portrayed Obama and Clinton working together to carry out Saul Alinsky’s plan to lead America down the path to national suicide and socialist tyranny. The two movies also appear to have something else in common: D’Souza complaining that he was a victim of political persecution in his conviction for violating campaign finance laws (to which he pled guilty). 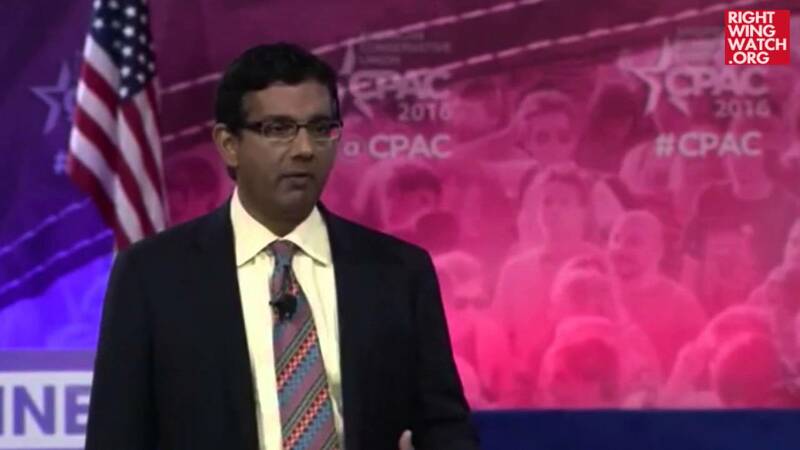 Like many Road to Victory speakers, D’Souza closed by making a pitch for people to elect Donald Trump in spite of his obvious shortcomings. Like the Super Bowl, he said, elections come down to two competing teams, and the winner gets to do what it wants with America. And so it seems to me that here we are, and the question before us is, do we want this Obama-Hillary machine, which has been grinding us down, not just picking our wallets but in a sense stealing— my book is “Stealing America,” and by stealing America I don’t just mean our money. I mean stealing our freedom. I mean stealing our American dream. I mean stealing our aspirations, stealing our ability to be who we are and pray as we wish and speak as we believe and think as we will.